← Hey – that’s not my giraffe! 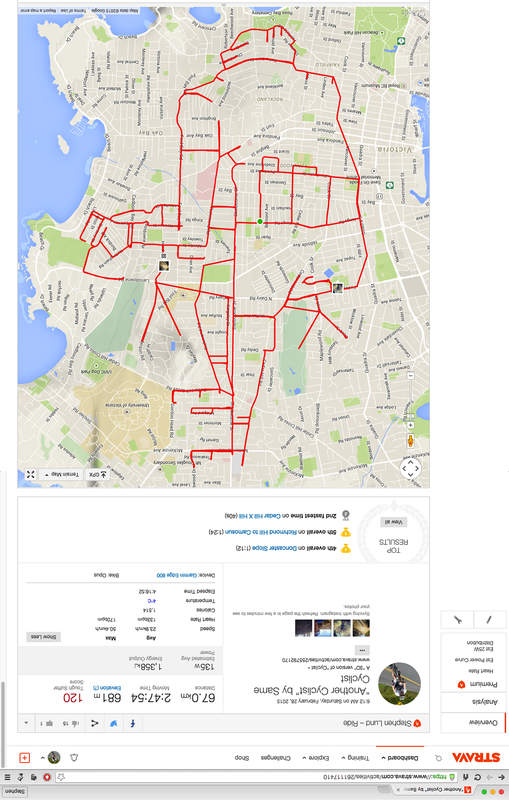 This work of Strava art by Stephen Lund takes a different perspective on one of his earlier works. Though it has the same orientation and shares roughly the same geography as my earlier “Cyclist” by Cyclist, the two rides have surprisingly few roads in common…at least above the cyclist’s waist. I had to do a fair bit of bush-whacking, stair-climbing and off-roading for this one. If you view the ride on Strava and zoom right in on the bike seat, you’ll see clearly where I was tromping up a muddy trail through blackberry brambles. Again, I flipped the image for ease of viewing. Below is a photo chronicle of some of the obstacles I encountered along the way. When you plan your Strava art using a map, you invariably run into some surprises along the way. This entry was posted in gps art and tagged bicycle, bicycling, creativity, cycling, cyclist, garmin, gps, gps art, strava, strava art, victoria bc. Bookmark the permalink. Wow! I had never heard of this till Shane reposted your blogpost. It looks amazing and after a good nights sleep (it’s midnight here), I am going to have to do some research into Strava ! (I did smile when Strava themselves tweeted about my giraffe as “one of the most creative pieces of Strava art we’ve seen.” Even THEY call it Strava art! Regarding Strava, I really didn’t know what the fuss was all about until I finally gave in and bought a Garmin (the GPS computer that records my movements) last fall. I did my first Strava art piece a few months later and, as you can see, have been hooked ever since!